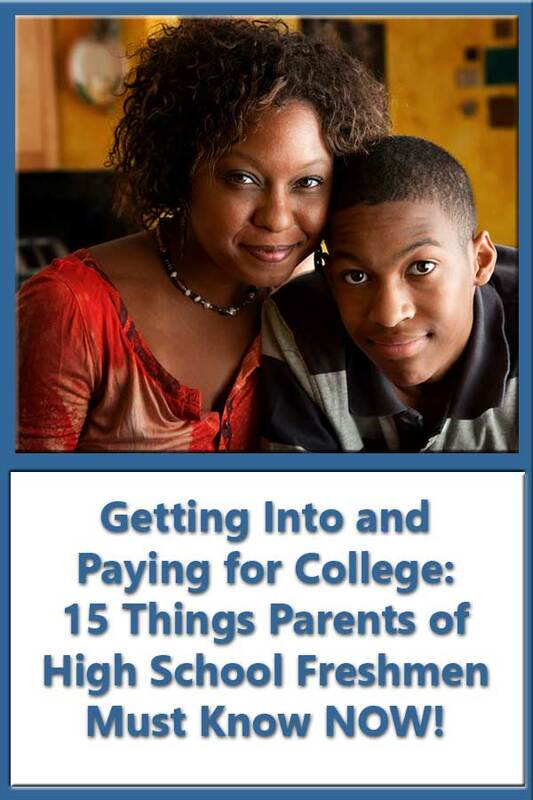 15 Things Parents of High School Freshmen Must Know NOW About Getting Into and Paying for College! As the parents of college freshmen drove home from dropping their kids off at college, many had to be thinking about how they’ll do things differently next time knowing what they know now. Many were probably wishing, “if only someone had told me four years ago that…, things would have been so much easier.” It’s a common dilemma in life, you don’t know what you don’t know. So I’ve created the following list of things that parents of high school freshmen need to know about getting into and paying for college. Let me know if you have anything to add. 3. The vast majority of students who apply to the most competitive schools such as Stanford and Harvard have grades and test scores as good as your high school’s valedictorian. And the vast majority do not get in. 4. Being a National Merit Scholar is not a guarantee for a free ride to college. 6. Over 70% of students are accepted at their first choice college. 9. You must set the expectation for acceptable colleges–not the rankings, not your child’s peers, and not your peers. 10. Most athletes to do not play at the college level and the majority of those who do are NOT receiving athletic scholarships. 11. Just because you don’t claim your children on your income tax forms will not make them independent students and eligible for more financial aid. 12. There may be millions of “unclaimed scholarships” each year, but the average size is less than $1,000 and for one year only. For most students, the largest scholarship (merit aid) will come from the school they actually attend. 13. The majority of colleges have four-year graduation rates less than 50%. This means that you are likely to pay more to graduate from some colleges than others. 14. You shouldn’t base your expectations on another family’s experiences. You don’t know what information was available to the college and you definitely don’t know how that family’s information compared to others applying to the college at the time. 15. If you find you don’t qualify for financial aid, don’t blame your situation on those that do. The average net price for students with family incomes of $30,000 or less at public schools is $9,633. The average is $16,441 for those with incomes between $75,001 and $110,000. Nobody is getting a free ride to college.